The little corner of the Intermountain West where I work has recently become something of a boomtown. The energy industry is king on high dessert and mountain plateaus, and many people have moved to town to work on the oil-rigs, natural gas pipelines, and now, wind-farms that dot the landscape. Workers come from across the country to perform the labor necessary to build these installations and typically work long shifts—seven days in a row of 18-hour days followed by several days off. These people fill up local hotels and trailer parks in rooms rented by the month, get paid cash, and travel home in between jobs to see family. I took care of one of these laborers a few weeks ago. A rare woman welder on an oil-rig, she had been working sixty miles from town when she got chest pain. She continued to work for several hours, but when the pain became more severe, her coworkers called 911. Volunteer EMTs (Emergency Medical Technicians) brought her to my ER. She was clutching her chest and looked pasty and sweaty on arrival. The medical term for this is diaphoresis. She explained that she had felt a little pain getting up that morning, but as the physical exertion required by the job had intensified throughout the day, her chest had hurt even more. In terms of her explanation, this woman was giving me a working definition of exertional angina, or the pain that comes when a person’s heart does not get adequate blood supply, and hence, oxygen. The medical term for this is ischemia. In simple terms, I was afraid this patient was having a heart attack. Although the heart’s main job is to pump blood to the entire body, with each beat (or more specifically, each time the heart relaxes between beats) it also redirects a small amount to blood to itself. This is important, because blood carries oxygen, and the body’s muscles and organs—including the specialized muscle, or myocardium, of the heart itself—require oxygen to sustain life. The heart’s own system of blood vessels are called coronary arteries, and when one of these gets blocked—usually by fat and plaques that build up on the inside of that artery—oxygen cannot be delivered to the myocardium that that vessel supplies. Anoxic cardiac muscle creates chest pain, and if that muscle goes without oxygen long enough, it can infarct, or die. From this sequence of events comes the term myocardial infarction (MI). The ER nurses had hooked my patient up to cardiac monitors and we checked an electrocardiogram, or ECG. An ECG (sometimes called “EKG”) is a tracing of the electrical impulses that makes someone’s heart work. Electrodes placed on the chest pick up these impulses and certain tracings indicate normal or healthy electrical patterns. Problems with the heart change these electrical patterns and their tracings look different. There are ECG patterns for irregular rhythms, for electrolyte abnormalities, and for heart attacks. How people much smarter than me figured out the physics of all these different tracings sometimes baffles me, but it is my job to recognize and interpret the different tracings that show up in the ER. I expected this woman’s ECG to show signs of a heart attack, but instead, it just showed ischemia—changes that can signal an impending heart attack, but that can also indicate other problems. More specifically, the waves of an ECG tracing are divided into segments named the p, q, r, s and t waves. Each of these represents a part of the hearts function, and lumped together, they can mean other things, as well. When things go wrong, these waves get messed up. The ECG change that corresponds with myocardial infarction is ST-elevation. ST-depression can precede it and indicates ischemia. This is what I saw on my patient that day. But in spite of the fact that she looked like she was having a heart attack, this ST-depression presented a somewhat vexing problem. The standard-of-care for myocardial infarction is cardiac catheterization, a procedure where a cardiologist places a large needle in a groin blood vessel and then feeds a tiny camera and specialized tools up through those vessels and into the heart—all in order to open up a clogged artery. If this fails, the patient is taken to the operating room and a blood vessel from another part of the body (usually a large vein from the leg) is used to reroute blood around the clogged artery. This is commonly referred to as “open heart surgery,” and more specifically, a coronary artery bypass graft (CABG). All this is fine and good, but in the little hospital where I practice, there is no cardiac catheterization lab, and no cardiothoracic surgeon. This means that when someone presents with an MI, my only option is to send them by helicopter to a larger hospital that has these capabilities. While I am waiting for the helicopter, I can perform temporizing measures that sometimes even solve the problem. There are medicines like aspirin and heparin that thin the blood, making it possible to slide around the clot, as well as clot-busting drugs like Retavase and tPA, which aim to dissolve the clot itself. I can also give cardiac-protective medications like metoprolol, a drug that slows the heart rate and lowers blood pressure, or nitroglycerin, which dilates blood vessels. But no matter how they work, the goal of all of these drugs is to get blood to the myocardium and to oxygenate the heart. Each of these drugs also comes with complications and contraindications. For example, you can make someone’s blood too thin, and it will not clot at all. This can lead to bleeding in the brain and to having a stroke. You can also make someone’s blood pressure so low that they cannot perfuse the brain. Because of this, every time I treat an MI, I have to go through multiple mental calculations, weighing pros and cons of giving versus not giving each drug. Is someone’s heart in enough trouble that it outweighs other risks? Usually this last question gets simplified into figuring out what will kill a patient first—the heart attack they are having, or the complication they might get from the medicine—and they are given the clot-busting drugs. But in my patient’s case that day, the answers weren’t completely clear. Without ECG changes that showed an obvious MI, did the risks outweigh the potential benefit? There was also the question of getting a helicopter in the air. An emergency team will fly in minutes for an obvious ST-elevation MI, but cardiologists are slow to dispatch helicopters for ischemic chest pain that can be solved by less expensive and invasive means. There was also the additional problem that my patient was a woman. Myocardial infarction was thought, for a long time, to be mostly a male disease, and many physicians still do not take a woman’s complaint of chest pain seriously. On the day I am describing, I got lucky. As I described the patient’s clinical picture and risk factors—a family history of heart disease, and a personal history of high cholesterol and life-long smoking—the cardiologist agreed that she needed quick intervention and dispatched a helicopter. I got off the phone about the same time one of the ER nurses came back into the patient’s room with the fishing tackle box that contains all of our cardiac medications. We gave Retavase, hoped the patient’s clot would bust, hoped she would not bleed into her brain, and hoped the helicopter would arrive soon. Initially, she got relief from her chest pain with the medications we provided. I imagined tiny red blood cells slipping around an ugly clot and carrying oxygen to aching heart muscle. The patient had time to call her two children and ex-husband and give them the news. But then things got worse. The patient’s chest pain not only returned, but intensified. 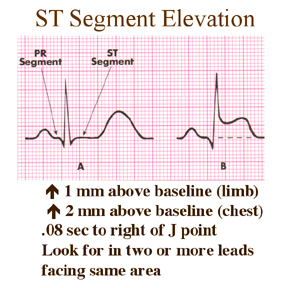 We checked another ECG, and in place of ST-depression, our patient now had clear ST-elevation. Because of how this change appears on ECG—and probably also because of what it can portend—these ECG changes are called tombstones. When I saw the tombstones on her ECG I was very glad that in spite of the risks, we had given the clot-busting drugs. As a mentor of mine used to say, sometimes it is better to be lucky than good. The next few minutes were spent working with this woman’s medications, trying to get her chest pain under control. Thrombolytics had been given, and a bag of heparin hung, so there was nothing else my team and I could do from a clot-busting or blood-thinning perspective. So I played with other drugs, but at each intervention, I was foiled. The patient could not tolerate nitroglycerin or Lopressor because her blood pressure was dangerously low, and although we were giving her intravenous fluid, even morphine—a time honored standard for chest pain—caused her blood pressure to fall further. Soon I realized that there was nothing to do but wait for the helicopter to come. So in a hectic ER full of screaming children, lacerations waiting to be sewn, and a couple of adults with vomiting and abdominal pain, I decided to sit with a stranger I had just met and watch her have a heart attack. She was not much of a talker, so mostly I just sat with her and sometimes held her hand. I was wearing green latex gloves, and each time the chest pain increased, she would close her eyes and squeeze my hand. “We are watching her MI evolve,” I said to the nurses who were helping me, and kept rehearsing in my head the series of rescue maneuvers—intubation, shocks, cardiac-code medications—we would pursue if her heart just plain stopped. But mostly I felt powerless. Impotent. ER doctors are trained to intervene, to make the good fight. It was uncomfortable, heart-breaking even, to come to the end of these interventions and discover there was nothing else I could do. “These people will take good care of you,” I told the patient when the helicopter team finally arrived thirty minutes later. Then they loaded her up and were gone. I have never been so happy to have someone leave the ER. Not because I did not care about this woman, but because I did. Wow, very powerful post, Annie. So… do you know what ultimately happened to her? When I read this I wondered if any of the people who wrote complaints about your ER top 10 were still sticking around here as lurkers. If so, I’d tell them: Digg this! I appreciated the moment-by-moment account of thought processes, alternatives, choices, and helplessness. Wow! That’s a cliff-hanger, all right. Well told, too. I especially liked and appreciated the background of the recent influx of oil and gas workers; it helped me picture everything very well. I love your direct, simple descriptions of the various medical conditions and procedures. I learned a lot *and* had a good time following the story. To delight and instruct, indeed! Plus, also, too, please let us know if you know what happened to the patient. This made me teary at the end. I wasn’t expecting the helplessness because you sound so in control and knowledgable up until that point. This coincides with a discussion I had with a co-worker. She was really worried about not having health insurance and the possibility of suddenly having an influx of health problems. It makes me happy we’re both young and much less likely to have stuff like heart attacks. Your point of view is fascinating. I make it a point not to watch ER, so it’s fascinating to hear of the pain fro the doctor’s point of view. The post left me with more appreciation for doctors, even more than I already have. Also wondering what you do to relieve stress (other than post on TGW). I don’t watch ER either, because every week seems like a race to out-extreme the last week’s episode. If your story were on that show, the helicopter would have exploded in a huge fireball right in front of the hospital, and your patient count would have tripled in 5 minutes. Fortunately for us, your post is not an action-filled blockbuster. But somehow it managed to glue me to the edge of my seat for longer than that show ever could. When I’m making tough decisions at work it’s a matter of whether I’m going to sell anything that day…I can’t even imagine the choices you have to make. Thanks, all, for your comments. It’s a long story, but I don’t know what happened to this patient. I wish I did. And Marleyfan, in answer to your question: not enough. Your question is a gentle reminder to do more. Thanks.